Veteran transatlantic gardener Graham Rice is the author of more than 25 books on plants and gardening, including the Royal Horticultural Society's Encyclopedia of Perennials, and the American Horticultural Society's Encyclopedia of Perennials (both from DK Publishing). He was trained in horticulture at the Royal Botanic Gardens, Kew, England. A noted journalist, garden writer and speaker, Graham has covered gardening for many major newspapers and magazines in both the United Kingdom and the United States. He has the rare distinction of winning garden writing awards on both sides of the Atlantic, and was recently honored with the International Contributor Award from the Perennial Plant Association. A prolific blogger, his TransatlanticGardener.com was runner-up for Garden Blog of the Year, and his New Plants blog for the Royal Horticultural Society is keenly followed. Graham is a judge for the world famous Chelsea Flower Show, is a member of a number of Royal Horticultural Society committees, and judges the RHS flower trials throughout the year. He divides his gardening time between England and Pennsylvania. Most of his garden is shaded, and he has grown (and killed) a wide variety of plants searching for those which will also withstand the dry conditions. When not in the garden or at his desk, Graham hosts a music show, The BritMix, for a public radio station. 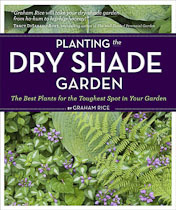 Timber Press came to Graham and asked him to write a book on one of their most-requested topics, for which no book yet existed, on creating a garden in dry shade. 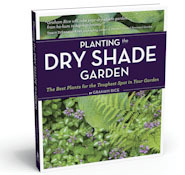 The result, Planting the Dry Shade Garden, helps you take dusty, root-choked soil cloaked in gloom to a successful garden in an area that once looked like a lost horticultural cause.